Having amassed a sizable amount of furniture and antiques during her European travels to add to her already large collections, my grandmother, Alice (McGinnis) Schiavon, now needed a place to put them. As much a lover of a good find as she was of the thrill of the hunt, my grandmother was a familiar face at antique stores and estate and second-hand sales both in Chicago and near the family summer cottage in Big Blue Lake, Michigan. She developed a passion for exquisite European antiques – not the kind one finds in an old farmhouse, but the type one would have in a fine home. She had a large assortment of porcelain, including Dresden, Meissen, Limoges, Sevres, Haviland, Capodimonte, Belleek, among others. 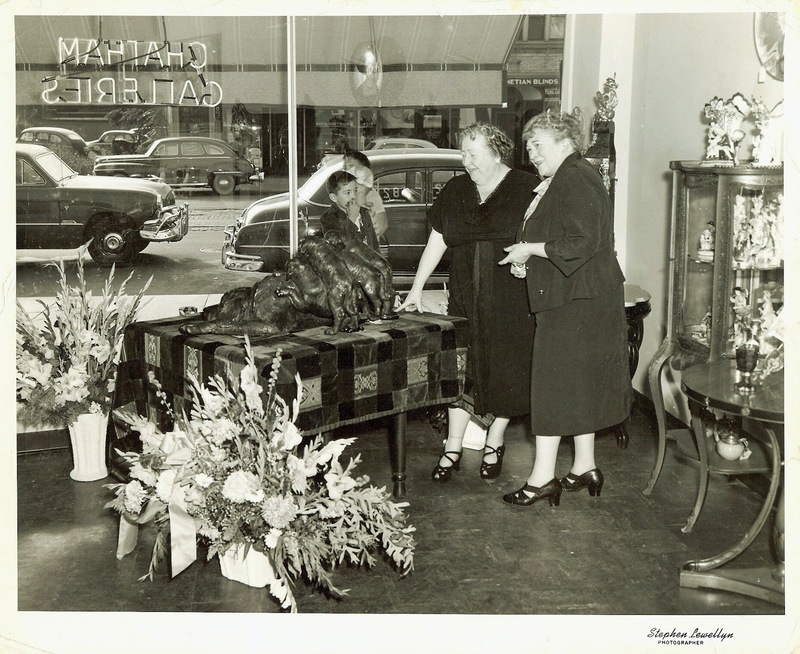 My grandmother, Alice Schiavon at left, with her older sister, Benita (McGinnis) McCormick, at the grand opening of Chatham Galleries, September 29, 1951, Chicago, Illinois. The bronze dog with puppies was one of the pieces brought back from Europe the year before. It was a favorite piece of my grandmother’s – perhaps this is why it was never sold. 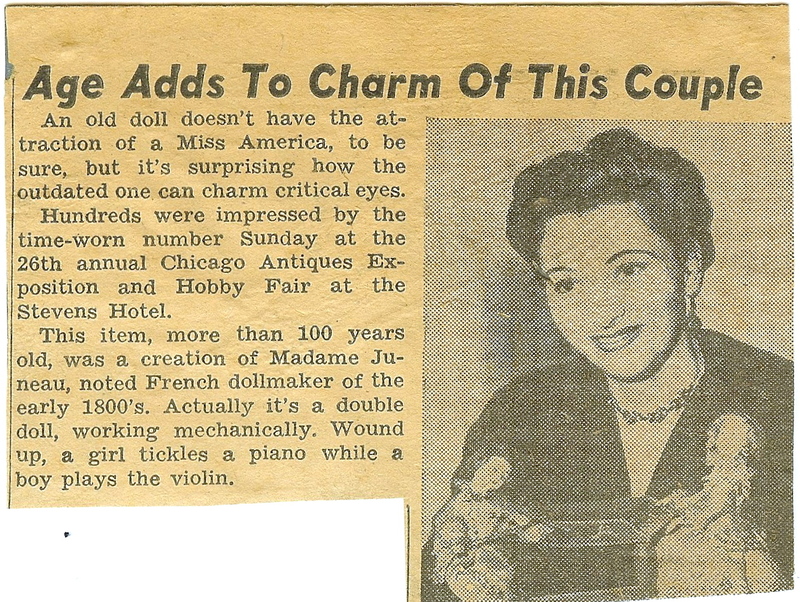 Her doll collection already took up considerable space in the family home at 8200 St. Lawrence Avenue.. A November 11, 1945 article in the Chicago Daily Tribune noted that the dolls took over the entire basement, at one time numbering 3,600. It was no surprise, then, that Alice needed more room to house her treasures. 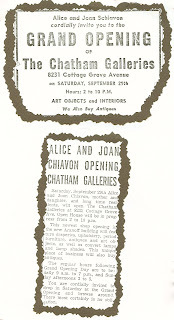 My grandfather, Ralph Schiavon, always supported Alice in her shopping expeditions. He understood that his wife was not content to be home cooking and cleaning but needed to be busy with her collections and projects. So when she suggested opening a gallery, he was happy to help her get started and gave her the funds she needed. He agreed with her that it would be a good opportunity for their daughter, Joan (my mother) to spend more time with her in a common endeavor; moreover, he liked the idea of my mother learning the ins and outs of running a business. 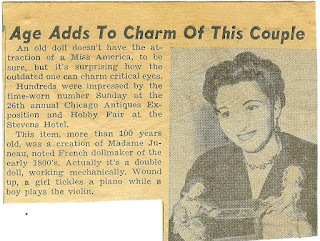 and Hobby Fair, published in the Chicago Daily Tribune. 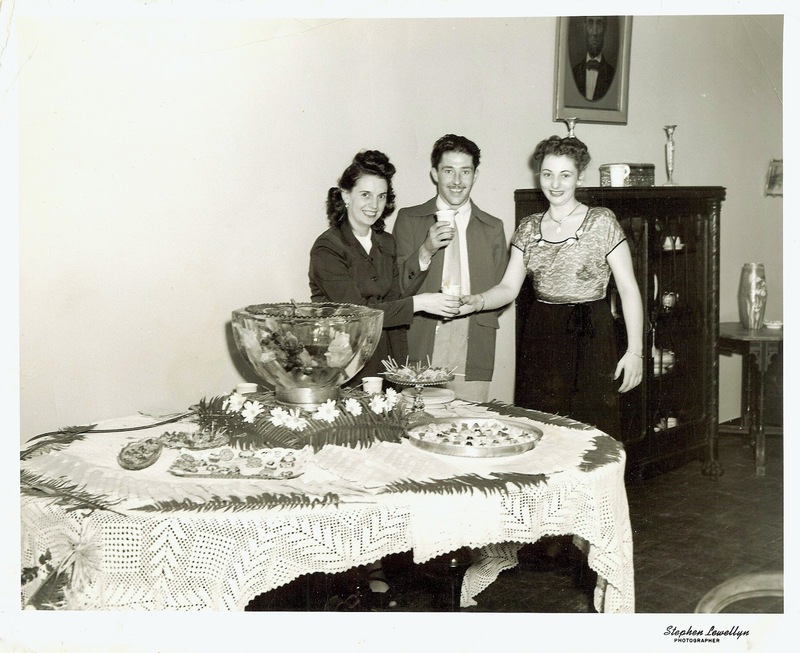 When Alice and Joan returned from their European adventure in the fall of 1950, they set to work to plan their business, scouting locations, contacting vendors, evaluating inventory, and arranging displays. 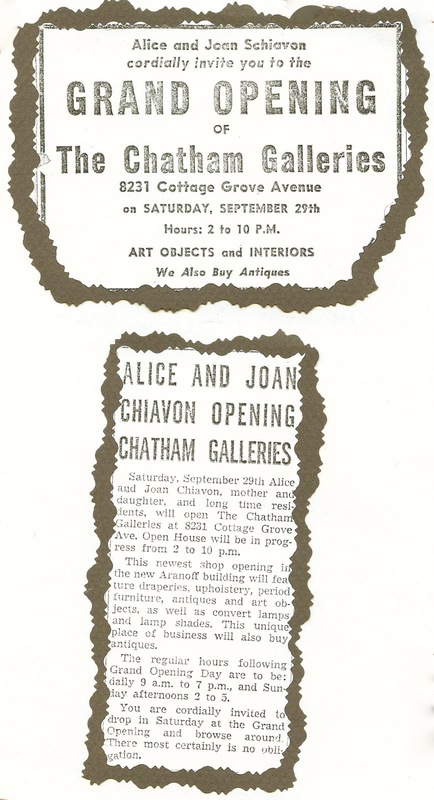 Nearly one full year later, on Saturday, September 29, 1951, they opened The Chatham Galleries at 8231 Cottage Grove Avenue, on Chicago’s South Side, stocking not only antiques but also fine art, gifts, and greeting cards. Interestingly, the name of the building it occupied was the Aranoff Building – a slightly different spelling than that of Abraham Aronoff of New York, who had been a constant companion of my mother and grandmother’s during their recent tour of Europe. My mother, Joan Schiavon (right), age 23 here, proudly greets her sister-in-law (and my godmother) Angelina (Ciliberto) Schiavon, just before the store’s grand opening. I do not know the identity of the young man in the center; could he be Angelina’s brother, Joe Ciliberto? My mother’s college friend, Margaret Yu, sent best wishes and hearty encouragement to the mother-daughter team. She recalled that in her own hometown of Hong Kong, the Chinese invited all their friends and family to visit on frequent occasions when they opened a new business. The idea was that when passers-by looked in the store and saw a crowd gathered, they would go inside, too, because they wanted to be part of whatever was going on. This seemed like good advice, and before long family, friends, and even some of my grandfather’s business associates were filling Chatham Galleries during several open house events. The store became a popular fixture in the neighborhood, and Alice and Joan began to see their share of business. My mother would later laughingly say, however, that my grandmother was her own best customer. Very interesting bit of history. I love that last line about your grandmother being her own best customer! That's just great! I suppose it would be very hard to part with her special treasures she brought back from Europe. And she had so many "treasures." Like the children of a loving mother, each one was unique and had special meaning to her. She passed this love down to my mother, who passed it down to my sisters and me. We used to polish her silver late into the night, as my mother told me the stories behind each piece. Now I do the same with my children! How cool that you are passing down the stories of each "treasure" to your children! I guess it's what most of us do, isn't it – keep the memories alive. Thanks for listing my post, Jana – and for taking the time to stop by.